Learning how to sew box corners is a great technique to use when sewing anything from handbags and tote bags to chair cushions and pillows. Ashley Hough shows you two different ways of how to sew box corners. The first method for sewing box corners requires you to first sew your two pieces of fabric together. Ashley demonstrates with small rectangles of fabric that could be used for a bag, but the process is the same no matter what project you are working on- the fabric should be sewn together right sides together. 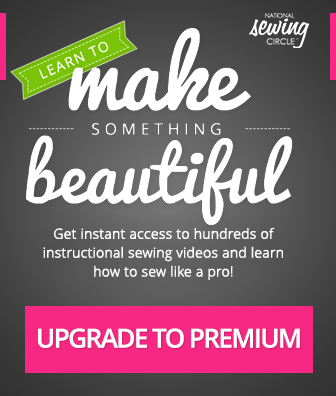 If you are new to this technique- check out how to sew corners first. Ashley then demonstrates how to align the seam along the bottom of the fabric with the seam along the side. She explains how to fold one seam allowance to one side and one to the other so that the seams lock together and are easier to ensure that they are aligned. Once aligned and pinned in place, Ashley explains how to draw a line across the corner, sew on the line and then cut away the excess fabric. She explains that they further away from the corner you sew, the larger the box corner you will get. The second method for how to sew box corners still requires you to first sew your two pieces of fabric together right sides together. Ashley again demonstrates this technique using small rectangles of fabric. She then shows how to cut a small rectangle from the corner of the stitched fabric pieces. She explains how and where to measure in from and how changing the size of square you cut from the edge will change the size of box corner you get. She then shows how to align the cut edges of the fabric, pin in place and then stitch back together to create the box corner. Once you’ve learned how to sew box corners- learn tips for sewing mitered corners. Nicole LaFoille teaches you how to print images on fabric to make something truly unique and personalized. First, make sure to read your printer manual and determine if your model has the manual feed function, which prints straight from the front of the printer to the back. Also, make sure it can handle thicker media. 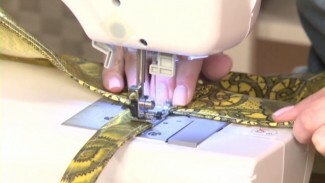 Beth Bradley teaches you fun and funky ways to use zippers on your garments or other projects. Learn the many creative ways to utilize your zippers as well as see the many kinds of zippers that are available. Find out how to make zippers a part of your design or how to best hide them.